The European Library originates from the TEL project to investigate the feasibility of establishing a new Pan-European service which would ultimately give access to the combined resources of the national libraries of Europe. 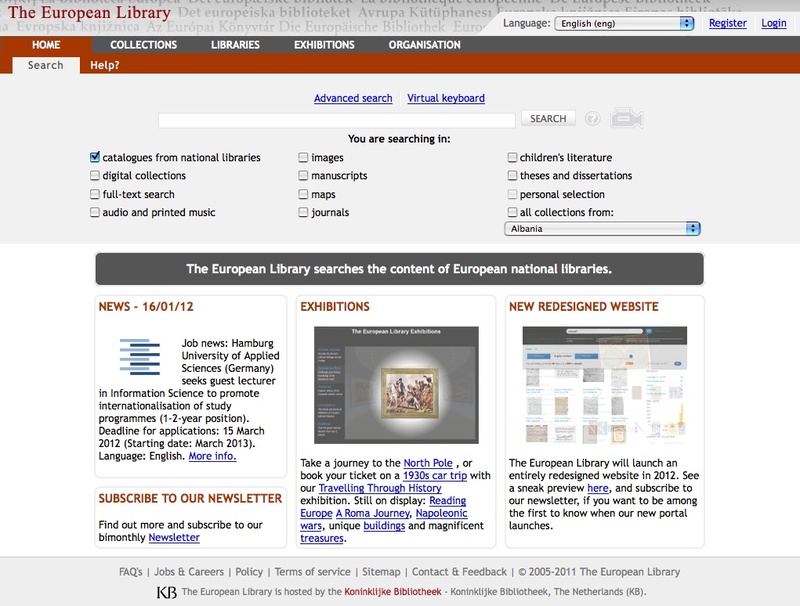 The European Library is a portal which offers access to both digital and non-digital resources (books, magazines, journals, etc.) of Europe’s 48 national libraries. It offers free searching and delivers digital contents (only partially free of charge). The library provides equal access to promote world-wide understanding of the richness and diversity of European learning and culture. The management, maintenance, design, and the editorial work is done by the European Library Office team, based at the Koninklijke Bibliotheek, the National Library of the Netherlands. The library’s website allows users for cross-collection searching within a huge virtual library collection; also available is a bimonthly newsletter for general updates. The User Guide, designed to help new visitors discover the site’s all search possibilities, is now available in 12 European languages. A FAQ file, a sitemap and an advanced search facility are provided, while users can browse the entire collections by country, subject, or by description.